We remember this week our confreres who are gathering at the Shrine of Ste. Anne de Beaupre in Quebec, Canada, to begin the work of building our North American Conference. This assembly is one of the first official meetings of the new governmental structure mandated by our last General Chapter in Rome in 2009. 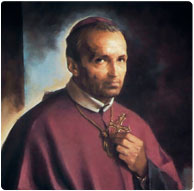 We pray for the Holy Spirit’s guidance and the intercession of St. Alphonsus and all of our Redemptorist saints. so that they may be able to discern your will.